Playing four games away from home, Minnesota just went 3-1 in its second-longest road trip of the 2013-14 season. MINNEAPOLIS — It included a clash with one of the West’s worst, needed some last-second heroics in California, played host to a double-digit defeat and concluded against a shorthanded Eastern Conference foe. But if ever there was a chance to turn something good into something more, the Timberwolves’ most recent road trip would seem to present it clearly. Playing four games away from the Target Center — three in a four-day span — Minnesota went 3-1 in its second-longest road swing of the 2013-14 season. It was the organization’s first time posting a winning record during an away stint of four or more games since December 2005 and featured the Timberwolves’ first three-game victory streak since the season’s outset. While such factoids point to the franchise’s frailty of the past decade and uneasy footing this campaign, they also offer credence to coach Rick Adelman’s claims this team has a season-turning run somewhere within its mish-mash of star power, streaky point guard play and foreign personas. "We played some tough road games, each and every one of them, but we feel like we have something good going here, especially heading into a couple of our home games," said forward Kevin Love, who found out during the trip he’d be representing the Western Conference as an All-Star Game starter next month. Before embarking for Utah last week, the Timberwolves (22-22) had won just seven road games and needed a semi-full of points to do so. The league’s worst defense in terms of field goal percentage wasn’t stellar during its most recent stretch either, allowing opponents to shoot 47.2 percent and score 104.5 points per game. But for the first time since besting Orlando, Oklahoma City and New York to open the season, Minnesota did enough to keep pace — over the course of days, not hours. "It’s a matter of just playing at a certain level," Adelman said. Last Tuesday, the Timberwolves used a balanced scoring effort to beat Utah — currently second-to-last in the Western Conference standings — for the second time in as many contests, 112-97. Kevin Martin came up huge three days later, scoring 26 points — equal to Love’s total for the game — and hitting the game-winning jumper with 8 seconds remaining. Martin was even better Saturday at Portland (30 points), but the Trail Blazers bottled up Love and dropped Minnesota to 3-7 on the second day of back-to-backs. The Timberwolves responded two days after, though, holding Chicago to 37.6 percent shooting and receiving a big lift from the bench in a 95-86 triumph. It was their first road win of the season that didn’t require eclipsing 100 points. Effectively sustained aptitude has been hard to come by for Minnesota this season. A small spurt such as the past week isn’t enough, Adelman said. "We have to play at a certain level game in and game out, and we’re gonna start winning our share of games," said Adelman, whose team sat three games back of a playoff spot before Tuesday night’s NBA contests. "But we’ve been up and down. We win one then lose one." Indeed, the Timberwolves are 1-11 in games decided by four points or less and have botched their last 10 chances to go over the .500 mark. 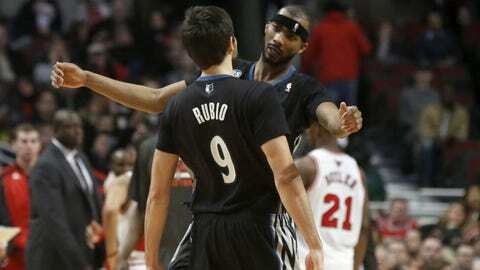 The next comes Wednesday at home against New Orleans, whom Minnesota trounced here on New Year’s Day. Then come tilts with Memphis and Atlanta. Seven of the Timberwolves’ next 10 games are in Minneapolis. They’ll navigate at least a handful of them without starting center Nikola Pekovic, who learned Tuesday morning he has right-ankle bursitis and will miss at least 7-10 days. That puts special emphasis on backups Ronny Turiaf and rookie Gorgui Dieng, who are expected to share minutes at the five until Pekovic can return. Playing without the NBA’s No. 2 scoring center will be a stiff challenge. But there’s at least a little more confidence in the Minnesota dressing room this week with the All-Star break rapidly approaching. "I don’t want to speak too soon," Love said, "but hopefully we can keep piecing these things together."